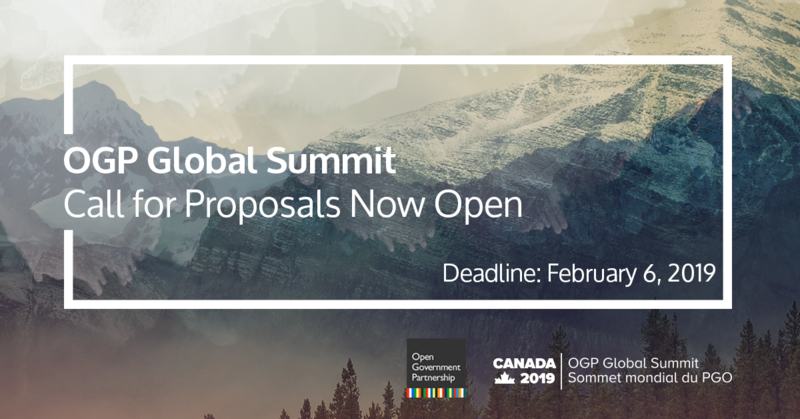 We are pleased to announce that the Call for Proposals for the 6th OGP Global Summit is now open with a submission deadline of February 6, 2019. The Summit will be held in Ottawa, Canada from May 29-31, 2019. Hosted by the Government of Canada, the summit will gather open government leaders and practitioners from across the world to share knowledge and together create solutions for more participatory, inclusive, and impactful governments. Participation: Enabling citizens, civil society and businesses to participate in government decision-making. This leads to more trust in government and better outcomes. Inclusion: Empowering under-represented citizens, regardless of gender, race, or sexual orientation, to engage actively with governments. This allows for more equitable governments. Impact: Helping citizens understand how open government affects their day-to-day lives. This makes government accountable for results that make a difference. Open: Other emerging issues that are aligned with Open Government. We hope to see the 6th OGP Global Summit further the collective knowledge and action on important issues relevant to the above-mentioned themes. This could include, but is not limited to, protecting and expanding civic space, testing new methods for promoting participation, and improving the quality and access of public services, especially for historically marginalized groups. Members of the OGP community are invited to submit ideas for topics, speakers and sessions here. To ensure that your proposal has the best chance of being selected, please consult the Call for Proposals Guide. The deadline to submit proposals is February 6th, 2019. After the deadline, an editorial committee, which includes representatives from the host government, civil society, and OGP Support Unit, will design the agenda based upon the proposals received. The committee will curate each track so that it includes high-level conversations, peer exchange, learning opportunities, and other dynamic formats to meet the needs of OGP’s diverse community. A draft agenda will be released in March 2019. Registration to attend the OGP Global Summit will also be required; registration information will be available soon. Further updates will be available at www.ogpsummit.org. Begin your proposal for the 6th OGP Global Summit now.